then further down says 48 hours only, confusing. I have one, its carp. Throughput varies drastically via ethernet. The beta firmware seemed to fix this but when they rolled out the official update it borked it again. Anyone know where i can buy a cheap lead/dock to turn this into an external drive please? ignore the above, i thought it was the network drive. well good deal or not? I have one, its carp.Throughput varies drastically via ethernet. The beta … I have one, its carp.Throughput varies drastically via ethernet. The beta firmware seemed to fix this but when they rolled out the official update it borked it again.Anyone know where i can buy a cheap lead/dock to turn this into an external drive please?ignore the above, i thought it was the network drive. so why not edit your comment? For 2Tb of space in the current market it's as good a deal as you're gonna get at the moment. I'm in need of some external storage at the moment and can't really gamble with waiting longer for a better deal to come about as I've been waiting for months as it is. 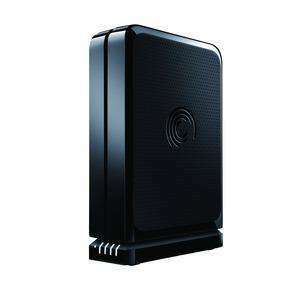 looking for external/portable storage myself as well, preferably 1TB potable usb3.0 but prices are still terrible, so might settle for 2TB external, and this 2TB seagate is currently the best deal, but seagate being my least liked hdd maker, does this model have the clickofdeath problem? worry that some reviews on amazon say the design of the case is bad, no ventilation holes so overheats easily? any opinions here from previous buyers? Ok so I've got a question to ask someone said that with a GoFlex drive you can stream content wirelessly to a tv is that right? i'm sure iv'e read somewhere it's a seagate drive inside. Would love to get this but the wife will have a fit if I do as already bought lots of carp on E-Bay this month - according to her!!! Must resist...must resist..I don't really need this... I really don;t ...AAAARGH!! Ok so I've got a question to ask someone said that with a GoFlex drive … Ok so I've got a question to ask someone said that with a GoFlex drive you can stream content wirelessly to a tv is that right? Not with this one you need a Seagate GoFlex Satellite. sadly the 3tb is almost double the price...when are they ever going to be reasonably priced?? OK thanks for that. it a shame or I would have brought it. They only do the Satellite in 500GB at the moment so I'm gonna wait and see. What's better, an external or internal HDD? Anyone know how much the USB 3.0 upgrade adapter cost. Depends on your needs, generally though at the moment external HDD's are cheaper then internal ones, so alot of people buy external HDD's then take out the hard drive inside them and use it internally. Bare in mind this usually voids any warranty. I'd say given that it's a Seagate product there's a fair chance of that. It'd be good to know the spec of the internal drive though for those planning to strip it out. Sata II or Sata III? 5400rpm or 7200rpm? Cache? £84.99 in-store if you need it fast and are close to a store! Anyone else who got this deal get the newer squarer shaped version with the USB 3.0 adapter? I opened the box today and the model is squarer shaped... I don't know the shape of the older version though..